Two Atlantic white cedars are in Cedar Swamp behind the Rogers ball fields. The trees have tall straight trunks, lacy-looking foliage, and roots in swampy water. The scaly leaves of Atlantic white cedars are food for the caterpillars of the Hessel's hairstreak butterfly, a species of special concern in Massachusetts. Every year winter's frozen landscape offers a chance to explore Westborough's swamps, as well as to get a better view than usual of our native Atlantic white cedars, the trees that gave Cedar Swamp its name. Atlantic white cedars (Chamaecyparis thyoides) are easier to spot from a distance in winter, now that they are not obscured by the usual lush green foliage of other plants. These evergreen trees typically have straight tall trunks and branches with lacy-looking, dark foliage at the top. Their leaves are not needles, but rather, small, flat scales that grow along small twigs. The solid footing in frozen swamps makes it possible to get closer than usual to Atlantic white cedars, which are water-tolerant and often grow with their roots in water. Not surprisingly, the tree is also sometimes called swamp cedar. 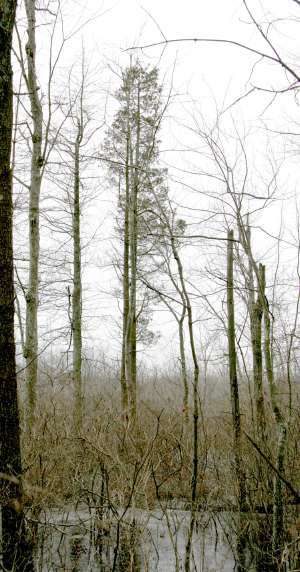 Most of Westborough's Atlantic white cedars grow in Cedar Swamp, especially near Cedar Pond. This pond lies deep in Cedar Swamp and is the source of the Sudbury River. In winter, the Sudbury Valley Trustees trail to Cedar Pond is open when the ground and swamp are frozen. The trail goes north to the pond from the field next to St. Luke's Cemetery (off Rte. 135). Most of the year this trail quickly becomes impassable because of water before you reach the pond. The other way to reach Cedar Pond is by canoe from Fruit Street in spring when waters are high. A more accessible part of Cedar Swamp containing some Atlantic white cedars is located behind the town's Rogers Property (where the Senior Center and the Rogers ball fields are). You can find some of the trees by following the trail at the back of the ball field. The walk is shorter than the one to Cedar Pond. A trail behind Hastings School also leads to this area. Yet another swampy area with just a few Atlantic white cedars lies off Lyman Street, between the parking lot behind Gold's Gym (and Blockbuster) and Chauncy Street, just south of Lake Chauncy. Here you might even be able to spot an Atlantic white cedar or two from your car, if you drive by very slowly on Lyman Street at a time of day with no traffic. Most of the cedars that you see in Westborough are not Atlantic white cedars. Rather, they are eastern red cedars (Juniperus virginiana). These sun-loving trees prefer dry soils and typically grow in old fields. These are the cedars that you commonly see in fields around Westborough. You'll find them in the Bowman Street Conservation Area and the Headwaters Conservation Area, or on Cedar Hill (which is in Northborough but accessible from trails in Westborough). You may also notice red cedars along trails, roadways, and parking lots. More inland parts of New England have another tree, northern white cedar (Thuja occidentalis), also known as arbor vitae (tree of life). This cedar also grows in swamps, but only in limestone soils, not in the acidic soils typical of our area. As it turns out, none of these "cedars," red or white, is a true cedar (Cederus family), such as the cedars of Lebanon (Cedrus lebani) of Biblical fame. Those trees are native to Asia. Like our "cedars," they have fragrant, lightweight wood with many construction uses. Atlantic white cedar is sometimes called southern cedar, and not without reason. Atlantic white cedars spread northward along the New England coast from the south about 5,000 years ago, as the glaciers retreated. As the climate warmed, they became more abundant than they are here today. They now grow in freshwater swamps and acidic bogs in a band about 50 to 130 miles wide along the coast, ranging from southern Mississippi and northern Florida up to Maine. The soft, durable, lightweight wood from Atlantic white cedars resists insects and decay. It is fragrant, has a straight grain, and is easy to work. Native Americans and colonists prized it for many uses. It has been used for Native American canoes, settlers' log cabins, charcoal for gunpowder in the American Revolution, ship-building, shingles and floors, organ pipes, barrels, tubs for whale oil and ice cream, and pencils. The Atlantic white cedars that colonists found in New England swamps were 2 or 3 feet in diameter. People would cut short logs of Atlantic white cedar and then carefully tap or bang them on the ends until the wood split along the tree rings. The resulting sheets were useful for shingles and other wood products. The demand for Atlantic white cedar eventually depleted the supply in our area, including Cape Cod. Atlantic white cedar is still commercially important in Virginia, North Carolina, South Carolina, and Florida. Today it is used for telephone poles, piling, siding, and boat railing. It is occasionally used for Christmas trees in some places in the south. Deer sometimes browse Atlantic white cedar, but the trees are especially important to the lovely Hessel's hairstreak butterfly (Callophrys hesseli or Mitoura hesseli), listed as a "species of special concern" in Massachusetts. In its caterpillar stage, the Hessel's hairstreak feeds exclusively on Atlantic white cedar leaves. This special relationship makes Atlantic white cedar swamps home to the butterfly. This green, white, and brown butterfly was last officially sighted in Westborough in 1988. Considering that a person probably has to get into Cedar Swamp in the spring or summer to spot a Hessel's hairstreak, it's probably a reasonable bet that the butterflies and their green caterpillars are still there. If frozen swamps are a little more than you feel like tackling this winter, consider making an excursion to see Atlantic white cedars elsewhere during the summer. You can see them conveniently at one of the places in Massachusetts where a cedar swamp has been preserved and outfitted with a boardwalk. If you're vacationing on Cape Cod, for example, check out the Atlantic White Cedar Swamp Trail near Wellfleet. It's part of the Cape Cod National Seashore in the National Park system. You can visit a closer cedar swamp at Ponkapoag Bog, part of the Blue Hills Reservation, near Canton and Randolph. It is owned by the commonwealth of Massachusetts. In addition to living Atlantic white cedar trees, Ponkapoag Bog features a boardwalk actually built of Atlantic white cedar in 1949.